Joyce Louise (Akin) Wyatt went to heaven to be with her family there, on January 23, 2019, at 5:52PM. A graveside service will be held at 1:00pm on Monday, January 28, 2019 in the Little Cemetery in Seminole, OK. Strode Funeral Home and Cremation is in charge of the arrangements. Joyce and her husband of 40 years had two daughters when they lived on a ten-acre acreage east of Seminole. They moved from there to Prague where they lived until 1970 when they moved to Stillwater. A talented seamstress, Joyce enjoyed her work as an alterationist at the Katz Department store in Stillwater. Joyce moved to Aurora, Missouri, seven years ago to be near family there. Joyce was preceded in death by her parents, Alva and Alpha Akin of Shawnee; husband, Pat Wyatt; Granddaughter, Nikki Jean Cain and her sister-in-law, Betty Sue Akin of Del City. She is survived by two daughters, Melita (Gary) Hatfield of Brookings, SD; Peggy (Rex) Dial of Aurora, Missouri; two grandsons, Bruce (Tacha) Dial of Springfield, Missouri and Jay (Rebecca) Dial of Lawton, Oklahoma; three granddaughters, Rebecca (Rob) Groebe of Kansas City, Missouri; Meghan (Garrett) Hollingsworth of Norman, Oklahoma and Danielle (Gavin) Dalglish of Aurora, Missouri; three great granddaughters, Grace Groebe, Emmy and Rosie Hollingsworth; one brother, Don Akin of Del City; two nephews, Brian and Gary Akin, Oklahoma City area. 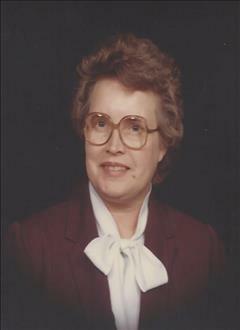 To send flowers to the family of Joyce Louise Wyatt, please visit our Heartfelt Sympathies Store.